I’m a little late getting this post up. I made this dish several weeks ago with a nod to Octoberfest. But what the heck, just call it Novemberfest. What’s Oktoberfest if not an excuse to indulge–isn’t that why we co-oped the German holiday, after all? This is an old Mennonite recipe, brought by those folks when they immigrated to this country. I found it in a catalog from the Penzey’s Spice Company. It’s relatively quick to prepare and perfect for a chilly fall day after working out in the yard. It can be served over mashed potatoes, or egg noodles, but when I made it I used a package of Spaetzle and served it all with fresh green beans. A cold glass of beer goes very well with this dish. Dirndles and lederhosen not required. 1. In a large deep skillet, melt the butter or vegetable oil over medium heat. Add the sausage slices and brown, about 4 minutes per side. Add the onion and cook until tender 3 – 5 minutes, stirring often. Browning the sausage with onions. 2. Add the vinegar to deglaze the pan, being sure to scrape up the browned bits on the bottom of the pan. Add the apples, bell peppers, cabbage, seasonings and apple juice or cider. Reduce heat to medium-low and cook for about 10 minutes, until the cabbage is tender but not mushy. Serve with mashed potatoes, egg noodles, or spaetzle. 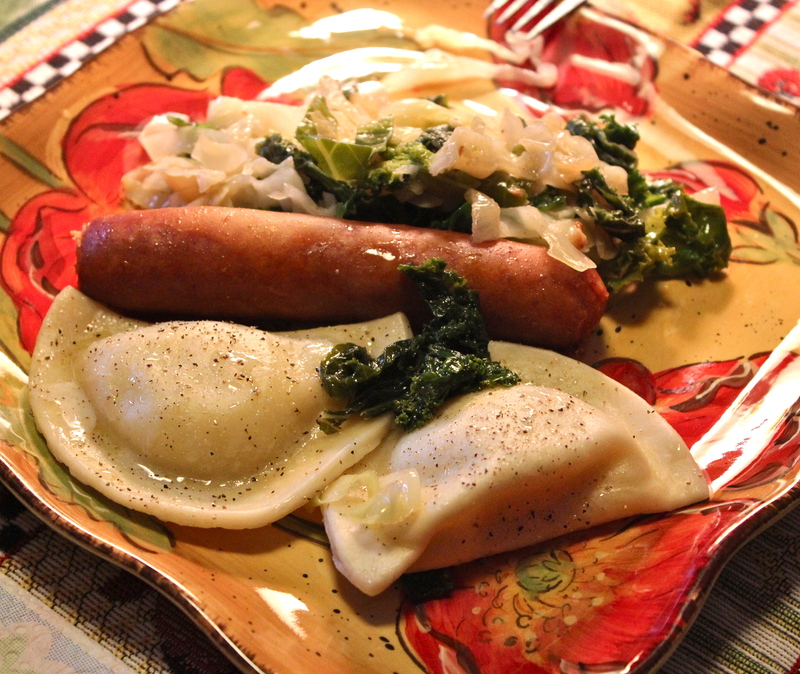 Sauted cabbage, cheddarwurst and pierogies. This dinner is about as rustic and peasant-like as it gets and it doesn’t have a recipe. This is a put-together that I make because Mr. D. loves it, and it is so easy. Besides that it is nutritious, utilizes convenience foods, and tastes super-good. My only concern when I make it is the sodium content, which can be high when you use processed meats. So be mindful of that and check labels when choosing your meat. This is not a meal that I ever thought I would include in my blog because it is so ordinary, but at the urging of my husband here it is. Whenever I make it, this is what he says after the first bite: “MMMMMMMM” I think this is probably a “guy’s meal”. Simple to make, hearty to eat. 1 package frozen peirogies, filling of choice. We like potatoes and onions. 1 package Cheddarwurst individual sized kielbasa, 6/pkg. Or you can use frankfurts, or bratwurst. 1/2 a medium-sized cabbage, roughly sliced or chopped. More if you like and are feeding a large group. seasonings that may include nutmeg, 5-spice powder, or some type of bavarian spice blend. 1. Bring a pot of water to boil. 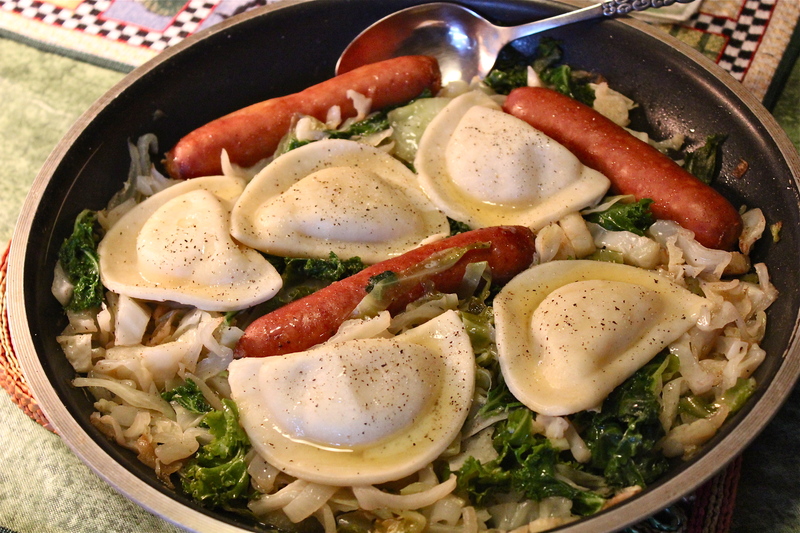 Cook pierogie according to package directions. Do not overcook. 2. Melt butter and olive oil in a large skillet. (large enough to hold everything–this is a one pan meal.) Add sliced onions and sauté to soften. Add the chopped cabbage and continue to sauté to lightly brown and soften the cabbage. 3. Season this mixture with what ever spice blend you may have. Usually nutmeg is a good choice. I use Tsardust Memories from Penzeys Spices and it includes salt, garlic, cinnamon, black pepper, nutmeg and marjoram. 4. 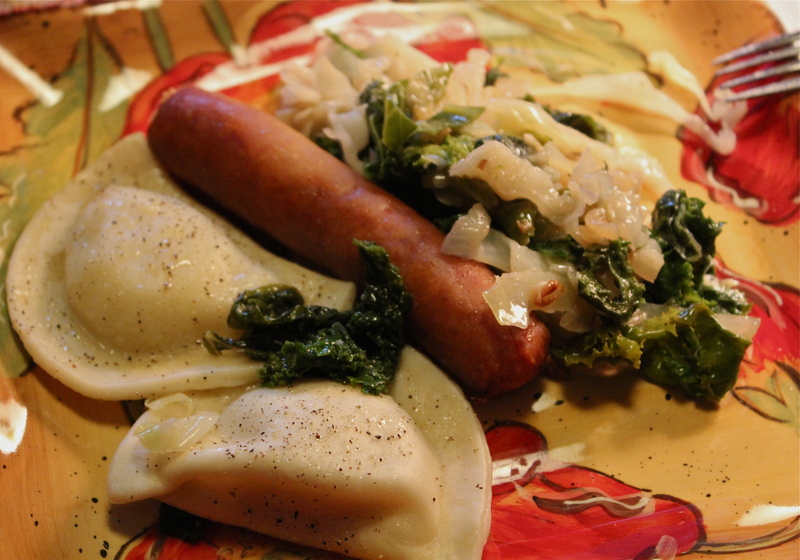 Place the cheddarwurst on the cabbage mixture and cover. If it is sticking to the pan, add a small amount of water just to keep from sticking. Allow this mixture to steam slowly while the pierogie are cooking. 5. 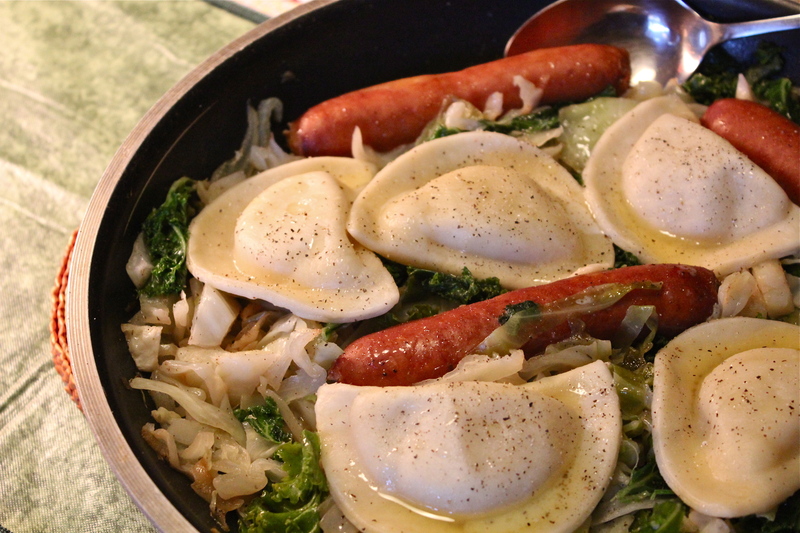 Add cooked pierogie to the pan, spooning some of the cabbage mixture over them. When everything is cooked and thoroughly heated through, serve. I like to melt some additional butter and drizzle it over the top just before bringing to the table. A complete meal in one pan. On this occasion when I made it, I had a small amount of kale to use up, so I added the chopped up kale leaves to the mixture just before putting the cheddarwurst in the pan. A nice way to get in some extra fiber and nutrition. I must say that when you know how to make a meal like this you can then swap in other vegetables or substitute a different type of meat –or no meat at all for a vegetarian version–and you will never be at a loss for a quick meal idea. Try this out, give it your own spin, and I hope you will like it. SOURCE: This is a Carolyn invention.